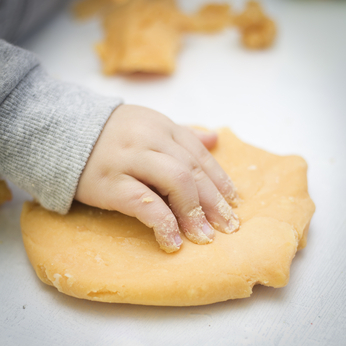 Home Uncategorized Homemade Playdough Recipe – No Bake! Homemade Playdough Recipe – No Bake! Published on October 2, 2013,	by Tina O'Connor in Uncategorized. In a medium size mixing bowl, mix together the flour and salt. Add the water and use your hands to knead the mixture into a dough. Add small amounts of water if need be until desired consistency is reached. Divide your dough in half or thirds, depending how many colors you want to make. Use food coloring to make lots of different colors! Play with your dough and store in sealed plastic bags or glass containers.